Daniel Moravec was born in St. Paul, Minnesota on November 20, 1984, and raised in a north suburban community by his father Jeff Moravec, who passed away April, 2009. On his 18th year, back in 2003, Daniel Moravec got into the world of poker with the help of a close friend, Benjamin Rood, who had invited him to learn Texas Holdem poker on an online poker room called 888 Poker. Shortly after, Texas Holdem was one of Daniel’s favorite hobbies. Daniel graduated from Centennial High School in Circle Pines, MN and moved on to The College of St. Scholastica in Duluth, MN. During his attendence, Daniel started the CSS Card Club, which was a group of about 10 people who met every week to play $5 and $10 tournaments. Daniel also arranged an annual charity poker tournament during his time as the President of the CSS Card Club. The buy-in for this tournament was 3 canned goods and prizes were all donated by local businesses. Towards the end of his Junior year, Daniel Moravec almost dropped out of college, seeking to take his poker career to the next level. Nevertheless, he completed his education and received two majors, one in Business Management and the other in Business Marketing. 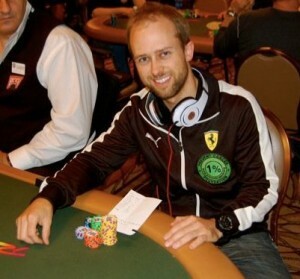 After graduating in 2007, Daniel Moravec was already making enough money from poker to consider moving to a friendlier state for professional poker players. That decision was made quickly and he moved into a house 25 minutes Southwest of the Las Vegas strip. Daniel was unfamiliar with no-limit casino poker, having only played no-limit Texas Holdem on the Internet due to no-limit being illegal in Minnesota. He began by playing $1/$2 no-limit Texas Holdem in June, 2007, and was playing in games as high as $50/$100 no-limit by April 2008. As of May 2008, Daniel was living in a luxury condo 5 minutes away from his favorite poker room, The Bellagio. His game of choice is $10/$20 no-limit and $25/$50 no-limit Texas Holdem. He began trying his luck playing WPT and WSOP circuit event tournaments and was at the 2008 Wynn Poker Classic.